I was reading comments made by a guy who said he can’t find any decent search marketing help. He is selling a cloud computing service. The marketers he talked to wanted to create landing pages and copy that read like a Blu Blockers advertisement. Buy now! Two for one deal! Constant calls to action. Twee headlines, along the lines of “They Laughed When I Sat Down At the Piano But When I Started to Play!”. They were advising a prescriptive, one-size-fits-all direct marketing approach. He felt they were totally wrong. Marketing approaches need to gel with the client, product and the audience. If used with the wrong product and audience – in this example, those who equate a hard sell with low quality – prescriptive direct marketing approaches can have a negative effect. Apple market to creative, hip individuals, or, more accurately, people who perceive themselves to be creative, hip individuals. Apple is not for everyone, it is “exclusive”. “Think Differently”, not the same as everyone else. Apple frequently invoke modern art and visual design reference points. There’s an elitism about Apple. This brand positioning comes from understanding the desires of their customers. Apple know their customers aren’t buying on features (Apple’s products often have fewer features than their competitors), price (Apple are often more expensive), or flexibility (Apple tend to lock the user in). They’re buying into something more universal: a desire to belong, and to be cool. Apple’s entire marketing approach orients around this truth. Now, imagine a Blu Blocker, hard-sell pitch to this audience? Would it work? This group would respond to pitches that involve belonging. Of cool. 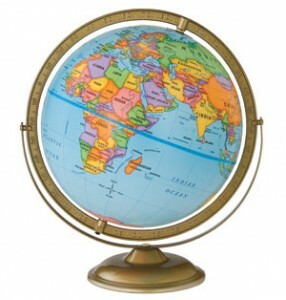 Of indidividuality. A hard-sell “call to action” is unlikely to work on consumers who are making lifestyle choices based not on need, but desire. Here are a few tips on how to think about landing pages in a less prescriptive way. The key is not to put the cart before the horse. Seek to understand the audience first, then work backwards. First, decide who the audience is, and what they want. The landing page is not simply a device to get someone to react, like an unthinking robot. Click here! Buy now! A landing page is something that can be used to draw someone deeper into your world. Reflect the audience back at themselves. Reflect their values and desires. Are they urbane? Security conscious? Conservative? Anti-authority? Homely? Your landing page should look like what your audience expects to see. It should use language that sounds like how your audience talks. Take a look at this Apple page. The Apple aesthetic is strong, as is the sense of community and desirability. They’ve also worked in the price point. 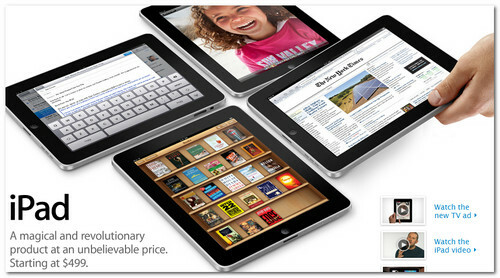 The hand grabbing the iPad implies you should purchase one. The pitch is not far removed from a hard sell pitch in terms of what it achieves, but it does so in a rather subtle way. It doesn’t push too hard. Your visual design is important. We’re a visual culture, and react to visual ques. Make sure, like Apple, that your design reflects the values of your audience, and the values of your product, else some of those click backs will come from people – rightly or wrongly – judging a book by it’s cover. 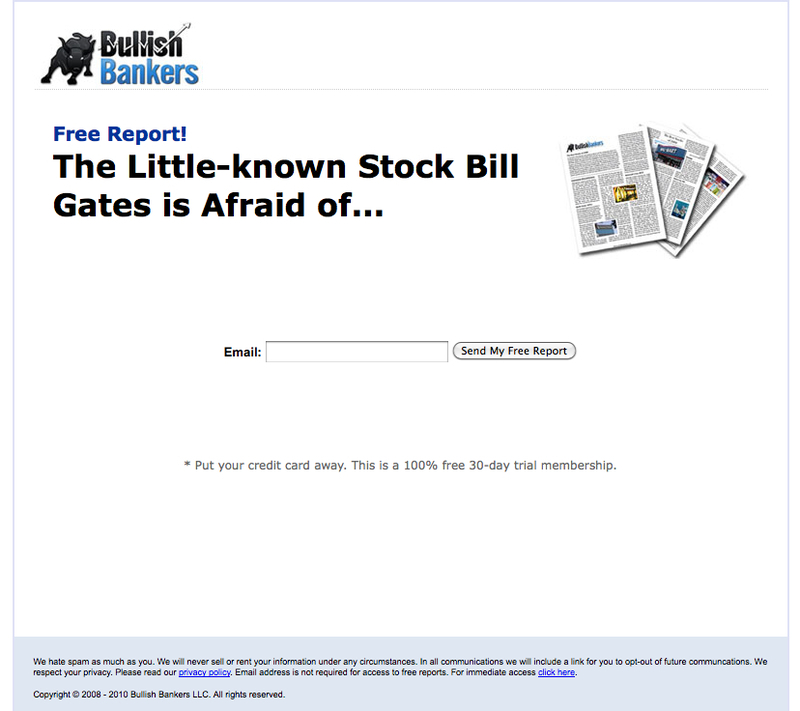 This is not to say all landing pages must have high-end, glossy design. On the contrary. High-end, glossy design may alienate, say, academic audiences. An academic audience may associate glossy design with the frivolous. A design that is likely to appeal to an academic audience is probably more Wikipedia, less Coca Cola. More depth, less flashy teen culture. ….and see what they come up with. Simply changing the “cover” might get you higher click-thrus and conversions. Even if you eventually get caught double-serving ads, just blame it on your various agencies’ not properly communicating with each other in scheduling campaigns. But hmmmm: they might just be onto something here if you’re a big-swinging brand: Double-dip your Adwords placements by directing traffic to your Facebook fan page as well. 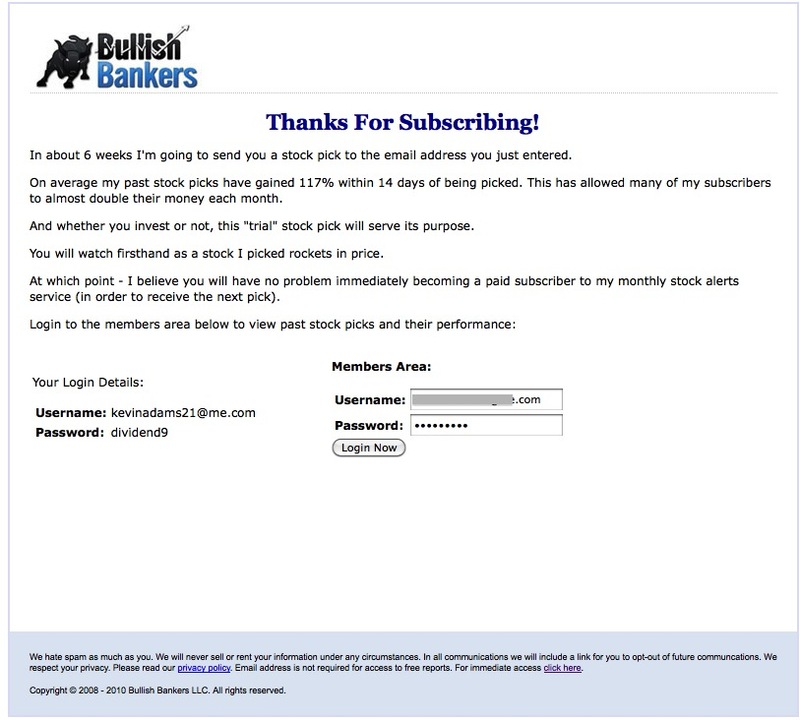 If you’re a small advertiser trying something like this, enjoy your “account disabled” email from Google. If 2009 was the year of Google’s Great Affiliate Massacre, Q3 2010 is about to go down MicroHoo’s kick at the can. Microsoft Adcenter sent a nice little reminder email out yesterday suggesting that the transition to Adcenter for Yahoo search ads is progressing quite quickly, and you may want to pay attention to impending changes if you’re an Adcenter advertiser. Microsoft and Yahoo! have created joint editorial guidelines that will begin taking effect for search advertisers in early August. The guidelines can make your ads more effective, while helping to create a safer search marketplace. 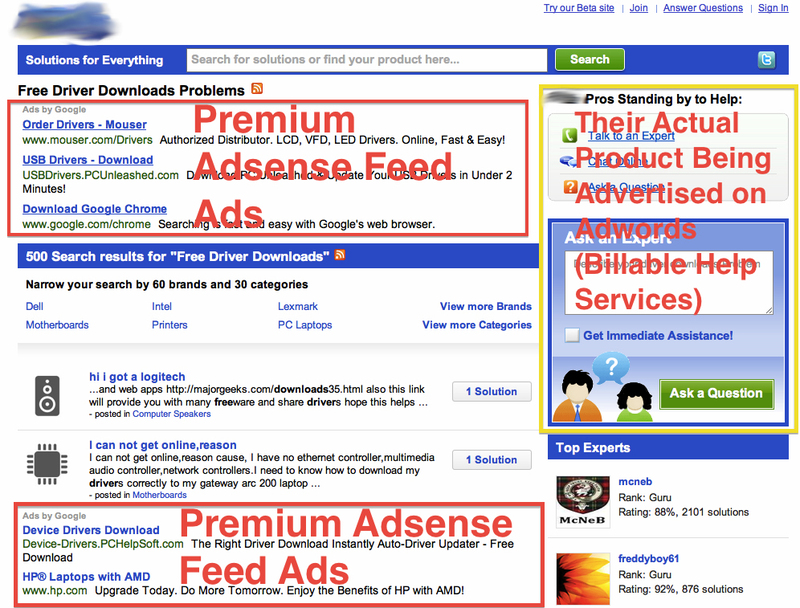 We encourage you to review these now, so that you understand any potential impact to your ads or keywords. Your website provides information—product reviews, for example—about goods or services that are represented by the trademark, and your principal offering is not any product or service that competes with the goods or services represented by the trademark. So basically, MicroHoo doesn’t have the resources that Google has to handle trademark bidding or with the same level of sophistication, so they’re going to adopt the old-school approach used by Yahoo for years. Given that the transition for ads has been scheduled for early August, it’s reasonable to expect the automated trademark sweeps and manual review flagging to start in Adcenter accounts soon, with the new guidelines generating mass disapprovals for advertisers that bid on trademarks the most: affiliates. No doubt, Microsoft’s goal here is to make their ad network a comfortable place for large brands to dump their spend, and the “we don’t allow your competitors to bid on your trademark” bullet point in the pitch deck is going to be helpful to this end. If you’re a paid search manager constantly fighting with PPC engines to prevent your competitors from appearing when users search for you, then this is a big win, and it seems Microsoft has your back. It turns out Microsoft is also taking a page from Google in some ways as well by creating new terms in their Relevance Guidelines that give them a fair amount of latitude in deciding whether or not they think a particular ad or landing page is “relevant”. Wiggle room here makes it easier on their reviewers to apply their judgement, however only time will tell how they get applied. But the smart money is having a look at these new guidelines yourself now and seeing what may or may not apply to your account. Whole books have been written about the ins-and-outs of landing page design. Each element on the page, each word, graphic, block of text and link, contributes to conversion, or lack thereof. However, this complexity can be boiled down to six essentials. What is it? What value are you providing the customer? What is in it for them? Your value proposition should be part of the ad text, and it definitely needs to appear on your landing pages. Whilst there are always exceptions, the value proposition generally comes first. People will judge the overall look of your page to determine credibility and relevance, and next they will try to determine what’s in it for them. Craft a succinct value statement that conveys your value to customers, and if possible, let people know the positive, compelling attributes that separate you from the competition. This is not to say that complex graphic design is desirable, however landing page design needs to be of sufficient quality that it doesn’t put people off. Design is obviously highly subjective, so take a look at the designs your competitors are using, particularly those competitors who rank highly over time. Does your design standard mirror theirs? Is it immediately obvious what action the visitor needs to take? Make your action buttons large and surround them with white space. Make text links bold, in that they stand out, visually, from surrounding text. Surround the calls-to-action with benefit statements that signal to a visitor what to expect after they click the link/button i.e. Click here to order [product/service] now! If you are asking a visitor for information, then keep your requirements brief. Deliver the visitor significant value over the time it takes for them to provide you with this information, and the risk in doing so. Cover the basics, such as contact information, security assurances, and privacy. However, trust elements need to be part of everything you do. Correct spelling and grammar, ensure fast load times, offer guarantees, state and answer objections, ensure terminology is aligned with your industry/visitor level, and your overall design quality is high. Your aim is assure, and reassure. After the visitor takes the desired action, what happens next? Is the end-to-end experience a good one? Beyond the shopping cart process, are you providing a seamless back-end experience? For example, are phones always answered in a timely manner? Are shipping times met? Do you get back to customers when you say you will? Can you handle the load if you receive more orders than you were expecting? Have you planned for this (pleasant) eventuality? You may understand what your landing page offers, but do your visitors? Do the “mom test” i.e ask “will my Mom understand this page/site”? Nothing against Moms, of course 🙂 Even if your audience is savvy, people don’t like to be faced with something they find cryptic. Everyone appreciates efficiency and clarity. The way to ensure this happens is to test. Show the page to people and ask them about the five points mentioned above. Can they recite the value proposition? Can they order easily? What do they think of the design? Do they trust it? It’s important to ask people who will be honest with you. Even asking such questions can be leading, so keep this in mind. The ultimate test, of course, is in the live environment. If you’re having problems with conversions, evaluate your pages and site against these six points. A lot of PPC advice is focused around direct marketing strategy i.e. you identify an audience and deliver them what they want. You convert at rate X. Repeat. For the most part, this works well. However, you may be missing an opportunity to spread your message to a wider audience, and this benefit could come free. Try to make your offer truly remarkable. Is your offer worth remarking upon? If not, could it be twisted so it could be, or put in a form that makes it easy to repeat? Purple Cow: Transform Your Business by Being Remarkable is a book by Seth Godin. The central theme is that offering me-too products and services is boring. Such goods and services won’t be remarked upon. Since we live in a world of saturated media, to be unremarkable is to go un-noticed. To not be noticed is the death of a business. If you haven’t read the book, I suggest you do – it’s a great read, and it’s short and to the the point. The lesson of being remarkable translates well online. Online marketers have picked up on it, using remarkable qualities of a message, or format of that message, to help ensure a message gets spread. The same tactic can be used in PPC. Take a look at your competitors landing pages. Do any of them stand out? Do they stand out in the sense that the message would be worth you repeating to someone else? That quality of being remarkable, or being repeatable, is a valuable marketing tool. Sometimes, all it takes to become remarkable is to twist your existing message into something unexpected. Like turning a typical cow into a purple-colored cow. It’s still a cow, but the way it appears makes it stand out. However, this isn’t just a cosmetic concept. Not only should you have a remarkable angle, but it’s best if you also need a remarkable, unique product or service. If this sounds familiar, it is – it’s a riff on the old concept of a unique selling point. Each advertisement must make a proposition to the consumer. Not just words, not just product puffery, not just show-window advertising. Each advertisement must say to each reader: “Buy this product, and you will get this specific benefit. The proposition must be so strong that it can pull over new customers to your product. The modern twist is that your message should also be repeatable. People should want to spread your message, and be able to do so easily. The benefit is that your message reaches a wider audience than it otherwise would. Obviously, this will not suit every product or service. For example, it’s hard to imagine toilet paper ever being truly remarkable, and being unremarkable has hardly affected toilet paper sales! However, it’s an interesting way to think about what you do. Is there some aspect to your service that you can twist in order to make remarkable and memorable? Could you promote it in such a way that people will be “forced” to remark upon it? 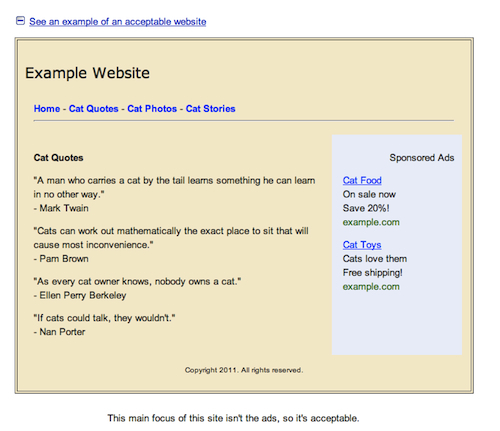 For example, you could use a quirky YouTube video on your landing page and encourage people to embed it in their site. What does this have to do with PPC? There’s no reason your landing pages can’t have a viral component to them that encourage people to remark on your product of service. You have people’s attention – you paid for the click – and you still need to convert people to a desired action. One of those desired actions could be to have people run with your message and repeat it in other channels. You could embed social media components, like video and Facebook groups, that facilitate people repeating or remarking upon your message. The pay off is that you create attention in other channels, and if the message does go viral, then you get a whole lot of extra marketing value for free. The Great Adwords Affiliate Massacre of 2009 will be forever remembered as a dark and confusing time for advertisers with affiliate relationships as the heart of their business model. Educated estimates indicate Google culled over 30,000 advertisers during Q4 of ’09. Obviously we are constantly looking at our advertisers to see whether there is an extraordinary [expand] that is happening. We have thrown in those advertisers who repeatedly attempt to scam users. So we went through one of our regular processes of looking at advertisers and seeing which ones of those we though weren’t adding quality or adding sort of value to our users. In those cases we chose to suspend them permanently. This was happening this quarter with the approach we took to suspend the repeated scam users as opposed to before where all we were doing was disabling certain bad ads. Does this have any material impact on the quarter numbers? It sounds like it could have had a slight impact from what I was reading. No the impact is slight. It is a relatively small number. In short, the 30,000 banned advertisers didn’t make much of an impact on the Adwords cash machine at all. So the screams of affiliates bitterly pointing that they ‘spend millions on Adwords’, fell on deaf ears. By all accounts, so did affiliates’ appeal requests to Google for reconsideration. Who Was Cut & Why? It’s pretty fair to say that aggressive affiliate marketers pushing fraudulent re-bill offers could likely have seen this coming. However, the wide net that was cast “disabling” the accounts of affiliates who hadn’t promoted “get-rich-quick-with-Google” or re-bill diet offers crushed a lot of affiliates’ primary revenue channel, while they begged for an exceptions to their bans. Repeated “slaps” of across-the-board ‘poor’ landing page quality scores against one or more domains used in affiliate campaigns. In retrospect, it looks like if you’d been “slapped” in the past more than once and just reloaded your campaign to a new domain, you were permanently disabled instead of bring ‘slapped’ again. If you had ever promoted any products associated with using Google’s brand to sell information products or business schemes, you were toast. By and large, direct-to-merchant affiliates or ‘direct-linkers’ were pretty much untouched. There were a number of merchant-of-record Adwords accounts that were disabled as well, likely false-positives in the automated sweep. Google denies the charge that they don’t want affiliates to use the Adwords system, and have updated various sections of their Adwords’ TOS in several places to supposedly clarify what exactly it is that Google wants from affiliates. An affiliate is an individual advertiser or website owner who has a business relationship with a merchant to promote the merchant’s product or service. The affiliate earns a small commission from the merchant for each referral that results in a sale; the merchant handles payment and fulfillment. Non-unique Landing Page: Google won’t show multiple ads leading to identical or similar landing pages at the same time, even if the pages have different domains. This means that if another advertiser’s ad leads to a landing page that’s similar to yours, and his keyword has a higher Ad Rank, his ad will show instead of yours. What the guidelines don’t point out is that if your site is repeatedly determined to be “low quality” as a result of insufficient amounts of “unique” content, it’s possible that you’ll likely to get swept out of the system altogether, or “disabled” as an advertiser, as you’re clearly (according to Google) egregiously violating their landing page -and by extension- affiliate guidelines on a repeated basis. Google even warns merchants who have affiliate programs of the danger that their affiliates can place them under as a result of this unique content enforcement policy. 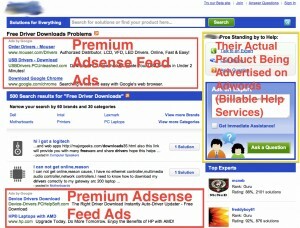 So What Exactly Does Google Want from Affiliates? There’s been a lot of speculation on this point, particularly since the Adwords ban hammer cleared the decks in Q4. For instance, some feel that direct-linking to a merchant’s site is all “Google really wants” to allow as far as affiliates on Adwords are concerned. Other PPC marketers feel that white-labeling products or somehow ‘rolling your own’ version of products or services you’ve previously promoted as an affiliate is the answer. What’s the real answer? No one knows, and there’s likely plenty of internal debate at Google as well as to what is acceptable and what isn’t. NFL coach Mike Singletary made that phrase famous, and most affiliate marketers just wish Google would “just show us what is OK” instead of subjective guidelines that make affiliates guess at exactly what kind of “unique content” they need to somehow generate in order to stick around on Adwords long-term. It’s obvious at this point that slapping together a bunch of ‘how-to’ articles or unremarkable wiki-style content about the topic you’re advertising on isn’t going to cut it, and Google isn’t about to cough up a list of their ‘favorite affiliate sites’ that you can run off and replicate. So we figured we’d put forward three examples of sites in different affiliate verticals that ‘get’ the unique, value-added content proposition in general. Hopefully they’ll provide some clear clear quality markers that even Google couldn’t possibly argue with. 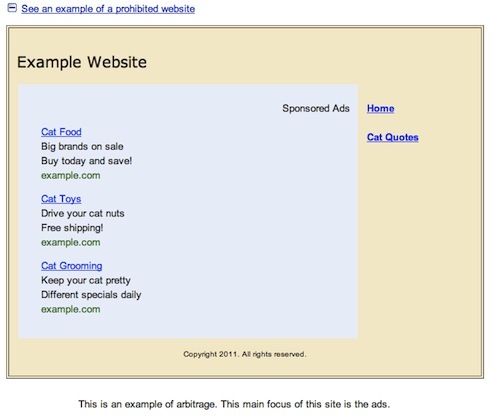 Not all of these sites use Adwords, but the principles apply nonetheless. Mint is a personal finance and savings site, basically an online version of Intuit’s Quicken. The biggest portion of their revenue model is credit card, insurance, and financial products lead generation paid out on an affiliate CPA basis. Of course, Mint has a lot more going for it than just calculators and the like, they also have reams of in-house generated, useful content covering a huge range of topics from personal finance and budgeting to investments and more. They also have a detailed section on user privacy, including videos from the founder on how they handle user data in a vertical where users are clearly sensitive to privacy. 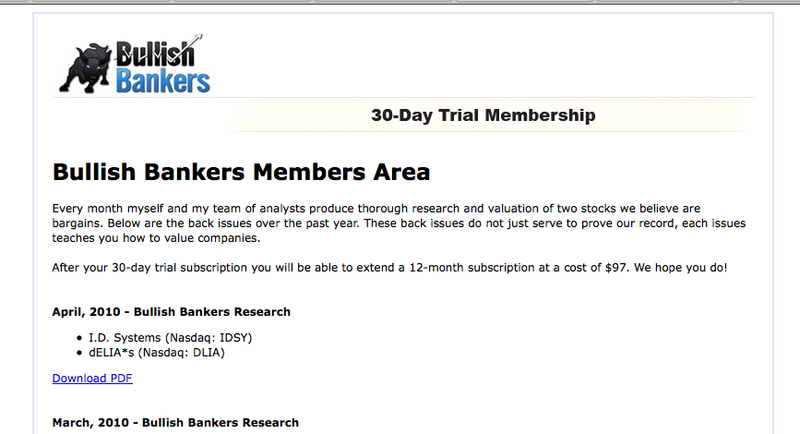 Ask yourself: Even if Mint had no corporate brand, when you look at this site, would it look like a “thin affiliate”? If Mint was using Adwords to promote credit card or auto insurance leads, would you consider them as providing a “value-added” affiliate experience? 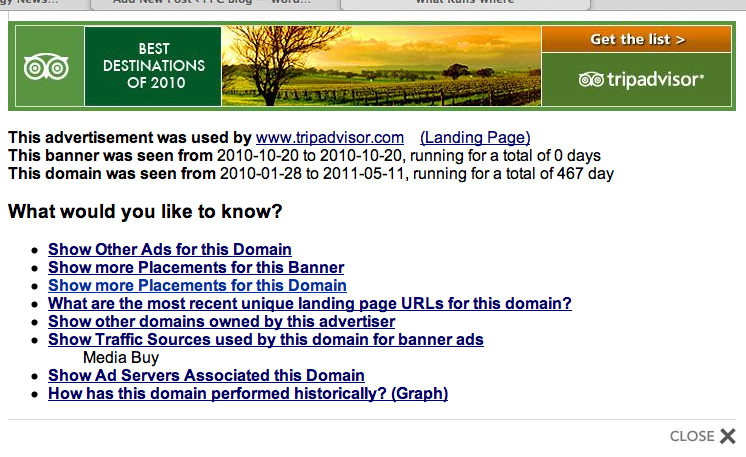 At its core, TripAdvisor.com makes money on affiliate booking referrals for hotels, flights, car rentals, and the like. How do they add value in such crowded space? 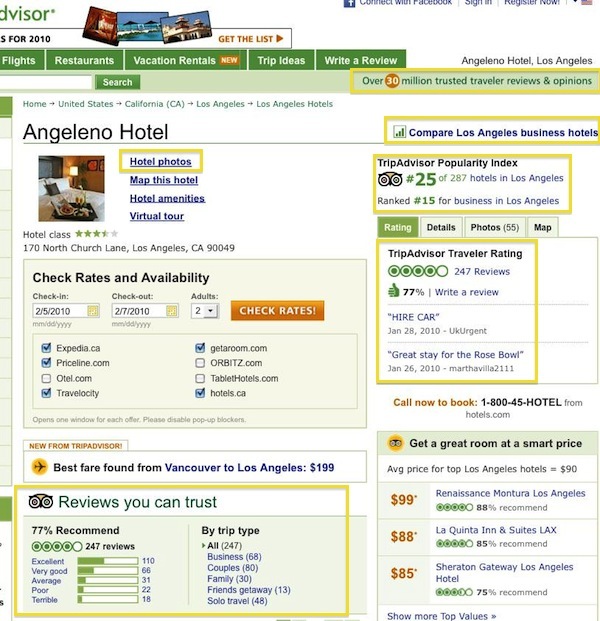 A system-wide rating and comparison engine, enabling customers to easily compare the popularity and quality of this particular hotel to others in the same hotel vertical (in this case business hotels). User-submitted photos. Customers can view and compare actual on-site photos from the hotel that other users have submitted to get an idea of what the hotel rooms really look like. Does this mean that your affiliate review site needs to have 247+ reviews to indicate a ‘quality’ site experience? Hardly. Obviously the more reviews and ratings the better, but if you work hard to populate your site with real user feedback (not fake comments!) over a period of time, you’re going to send similar signals to Google. Ask yourself: Even if your site was smaller than TripAdvisor, if you provided this kind of end-user value, would you look like a “thin affiliate”? Could Google say you’re not adding “unique content” when advertising hotel or flight bookings with Adwords? Granted, CrutchField is an online reseller and not strictly an affiliate, but the differentiators they’ve implemented hold a plethora of ideas for e-commerce affiliates to move beyond the straight-up product feed. Every electronics reseller is pitching basically the same thing, no doubt fed from a reseller product feed. The Learning Center. Crutchfield has gone to the trouble of strategically placing helpful, expert advice on the products genre being viewed, and placing a drop-down list of other “shopping guides” and “need-to-know” pointers specifcally applicable to the products listed. The pictures and names help add a personal, trust-enhancing aspect to the additional content. The Popular Questions and Helpful ideas portion of the page also helps hook the visitor on the page longer by answering common questions that shoppers have. Note that these portions of the page aren’t hidden, buried in light-colored footer links. 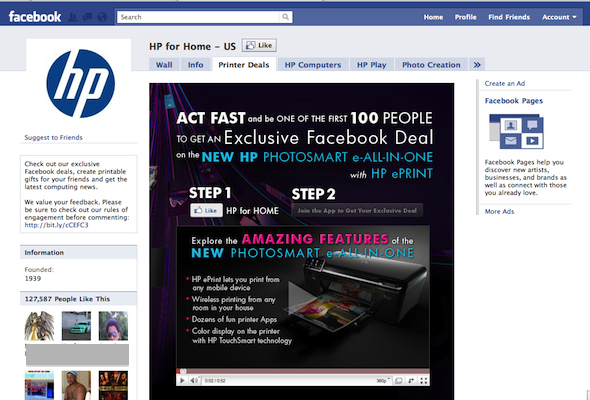 They’re front and center, and can no doubt help improve conversions for the highly technical products being advertised. The Shopping Tools feature in the left nav provides custom tools that Crutchfield has taken the time to develop to help set them apart from competitors and enhance conversions. If you’re promoting affiliate shopping feeds on your site, with Adwords or without, you have to read Rae Hoffman’s outstanding article on how to make your feed site unique. 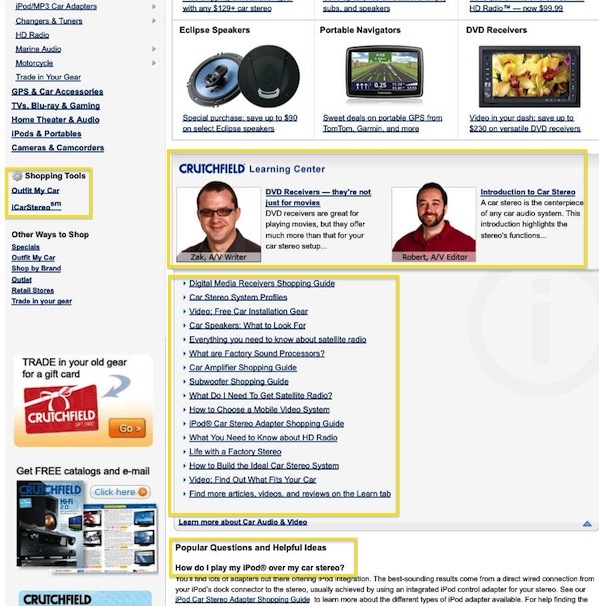 Ask yourself: Would Crutchfield’s e-commerce site be easily classified by Google as a “duplicate-content, affiliate feed site”? Would it be fair to say Crutchfield has earned the right to have its ads shown right up against the Amazon’s of the world in the Adwords auction? But That’s Way Too Hard! Is it? How many man-hours would be required to thicken out your site enough to be secure as an Adwords affiliate advertiser in 2010? Would you make your money back on the work involved if you were able to take advantage of the fact that thousands of competitors have recently been removed from the platform? Who Says This is What Google Wants? This question is broken. The bottom line is that no one knows what Google wants now, tomorrow, or 3 years from now. The answer lies in what the user wants. The Adwords affiliate game is now dramatically harder. If you’re not a publicly recognized brand advertiser, auto-generating 25 pages of crap article re-writes, stripping out all site nav, and squeezing visitors too hard into a lead form or cart is just not going to work in 2010. As always, there will be some affiliates that continue to fly under the radar for a month or two here and there, but if you’re looking to be around on Adwords long enough to make all the additional heavy lifting cashflow-positive, you’ve got to up your game. It’s not what you think is “enough for Google”. It’s about unique site features actual users would give a crap about. If your site was removed from the web, would anybody notice? Would anybody care? If you didn’t own your site, would you visit it or buy anything off of it? Why would you recommend your site to a friend? Some say SEO and PPC are converging into a Quality Score black hole. Maybe if we could honestly find good answers to questions like these, Google’s quality team wouldn’t seem so scary.